Last Sunday, I took advantage of some glorious winter sunshine and headed out to Bethnal Green and Old Ford Road to find the location of a corner shop my father had photographed in 1986, when small, family owned corner shops still catered for the day to day needs of many Londoners. 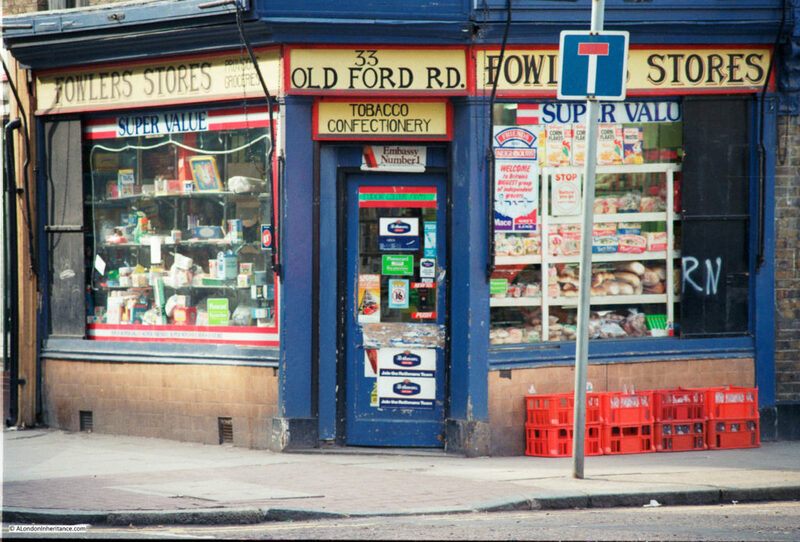 The 1986 photo shows a typical London corner shop. Shelves up against the window stocked with items such as Mothers Pride bread, a rather random assortment of household goods in the window on the left, always plenty of cigarette advertising, milk bottles in crates left outside for collection, and in Fowlers Store, an advert for Tudor Colour Films at the top of the door – a film brand I tried once as it was cheap before returning to Kodak. 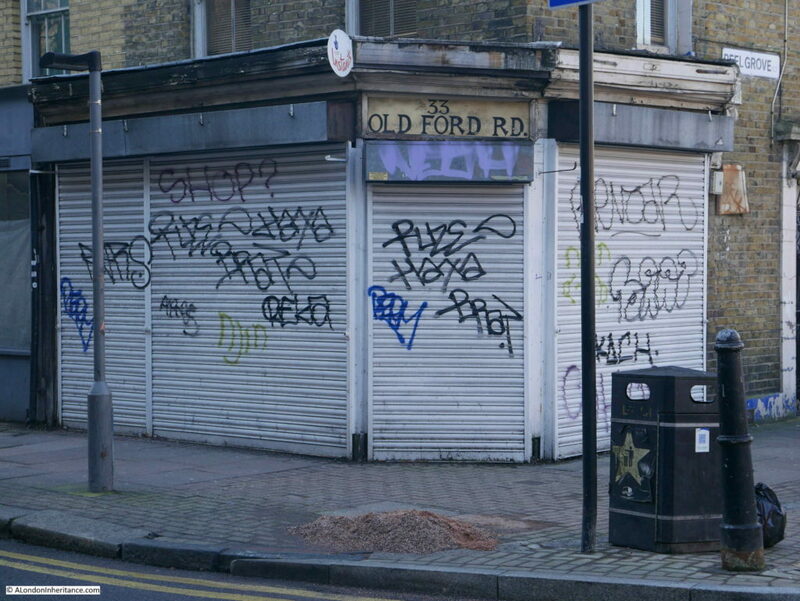 What can be seen of the outside of the shop today looks in very poor condition, although I am surprised that the 33 Old Ford Rd sign is still there – 33 years after the original photo. I would love to look behind the shutters and see how much of the original shop survives. I am not sure when the shop closed, on the occasions I have walked along Old Ford Road in recent years it has always been closed with the shutters down. There is a National Lottery Instants sign just above the door in my 2019 photo. I believe these were distributed when the National Lottery started scratchcard games in 1995, so the shop was open in the middle of the 1990s. I checked the historic view feature in Google Streetview and the shop was closed in all images back to the first in July 2008, so the Fowlers Stores must have closed between the mid 1990s and 2000s. 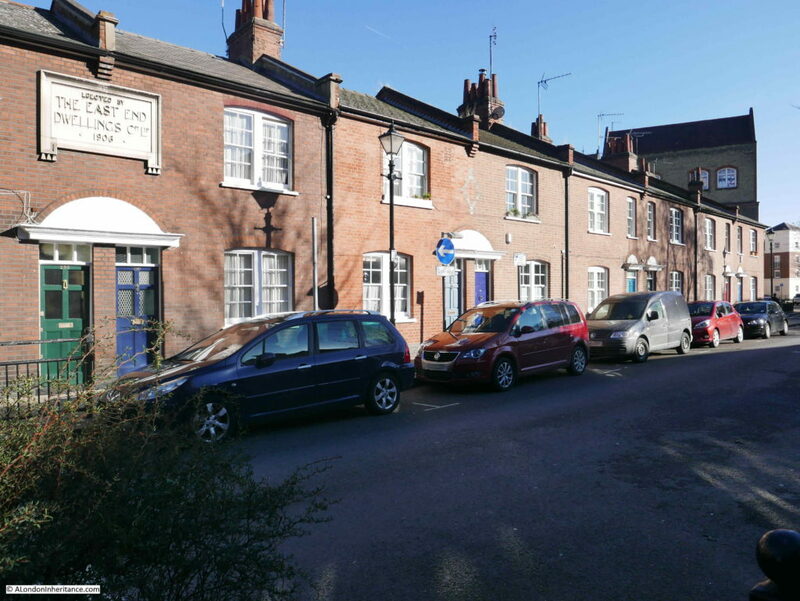 33 Old Ford Road is located at the Cambridge Heath Road end of Old Ford Road, on the corner with Peel Grove, a street that is now a short dead end after the grounds of a school took over the central section of Peel Grove. The shop is at the end of a terrace of 19th century houses / shops. The buildings do not date from before 1850 as an 1844 map shows a limited amount of buildings here, along with some subtle road changes as Old Ford Road originally terminated further to the right of the above photo and this stretch appears to have been a combination of North Street and Gretton Street. The North East London Cemetery was located just to the north where the school adjacent to Peel Grove is now located. I suspect it has been a shop for most of the life of the building. In the 1891 Kelly’s London Post Office Directory, 33 Old Ford Road is listed as being occupied by William Stone – Grocer. Given that the shop has probably been closed for at least 10 years, I am surprised it has not been converted for some other use. 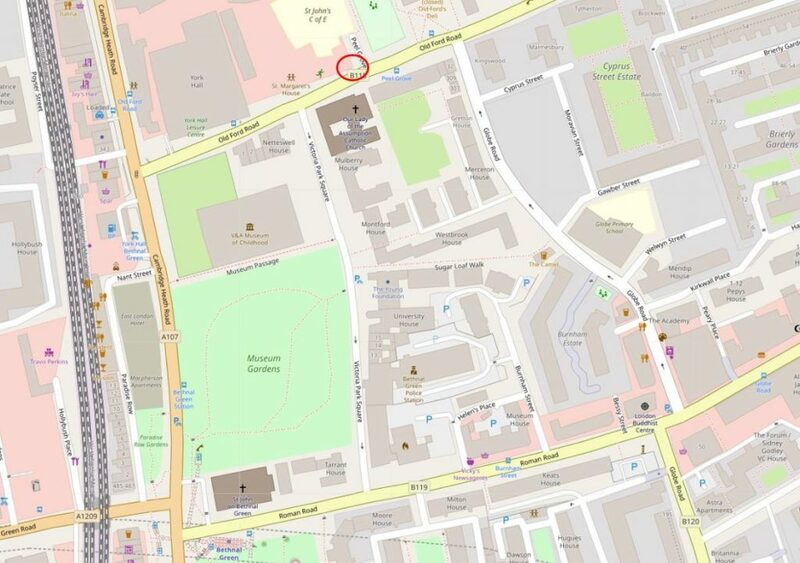 The map below shows the location of the shop marked by a red circle. As usual, I use visiting a specific location as a reason for exploring the local area and after finding 33 Old Ford Road, I went for a brief walk. 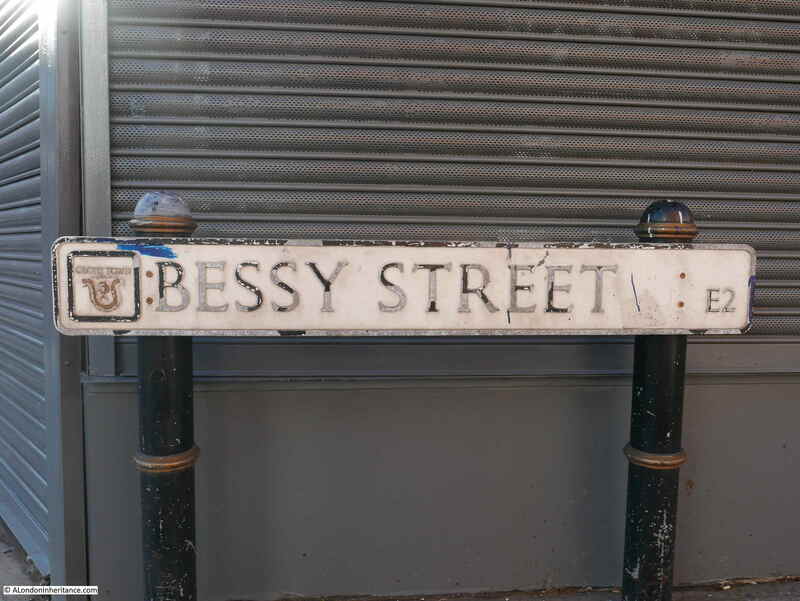 I have already explored part of the area when I was tracking down sites listed as at risk in the Architects Journal focus on East London in 1973, but there were a couple of other streets I wanted to visit. Turning off Cambridge Heath Road into Old Ford Road, before I had reached number 33, is the magnificent York Hall. This magnificent building, opened in 1929, was at risk a few years ago, but fortunately has been saved and is owned by Tower Hamlets Council. “LIVELY TIME FOR LIBERAL LEADER – FASCISTS HURL TOMATOES AND LIGHT BULBS: Tomatoes and electric light bulbs were thrown at the platform, when Sir Archibald Sinclair, Leader of the Parliamentary Liberal Party, was subjected to noisy interruptions while addressing a Liberal meeting in York Hall, Bethnal Green, London last night. Three hundred Fascists had got into the hall with tickets which, it was alleged, they had printed themselves. It was not until the police had ejected a large number of people that Sir Archibald Sinclair was able to make himself heard. He was continually interrupted, and there was an uproar as a man was ejected. When Sir Archibald rose the Fascists sang their marching song “We Want Mosley”. There were attempts to drown his voice by singing. ‘Some people want to hear Mosley’ Sir Archibald shouted into the microphone, ‘but he isn’t here to be heard. The reason they are anxious to stop me speaking is that they know the words I speak will express the opinion of the great majority of people in Bethnal Green. I could not do so much for the Liberal cause as these people are doing’. When the crowd again began to chant ‘We want Mosley’ the chairman said, ‘We will telegraph to Mr. Hitler and say that his hirelings have been playing his game’. 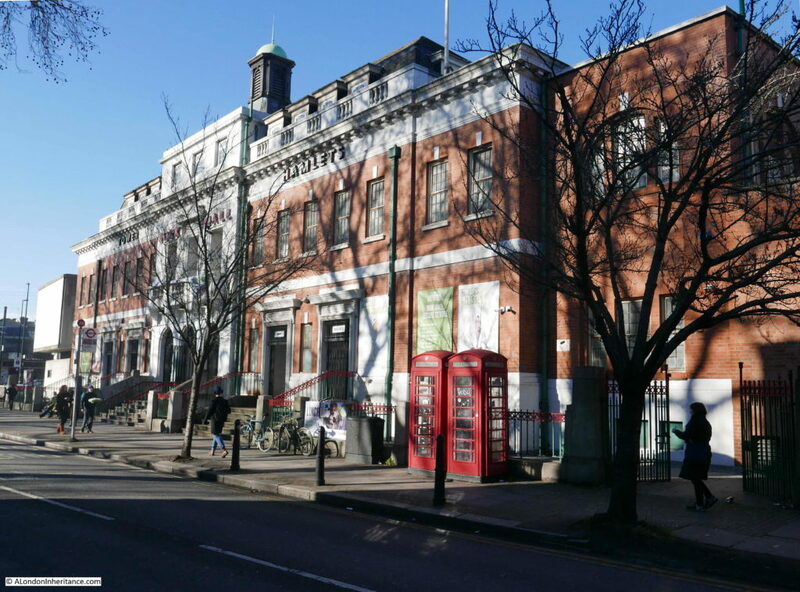 York Hall hosted other, rather more peaceful events, for example, a couple of years earlier the hall was hosting an exhibition by the Bethnal Green Chamber of Commerce, where there was a miniature brewery on display, demonstrating the complete process of brewing and bottling. Old Ford Road is an interesting road. It reaches almost to the River Lea having crossed the Regent’s Canal. The name is a reference to an old crossing point through the River Lea. I will save that walk for another time, as last Sunday, just after number 33 Old Ford Road, I turned right into Globe Road. 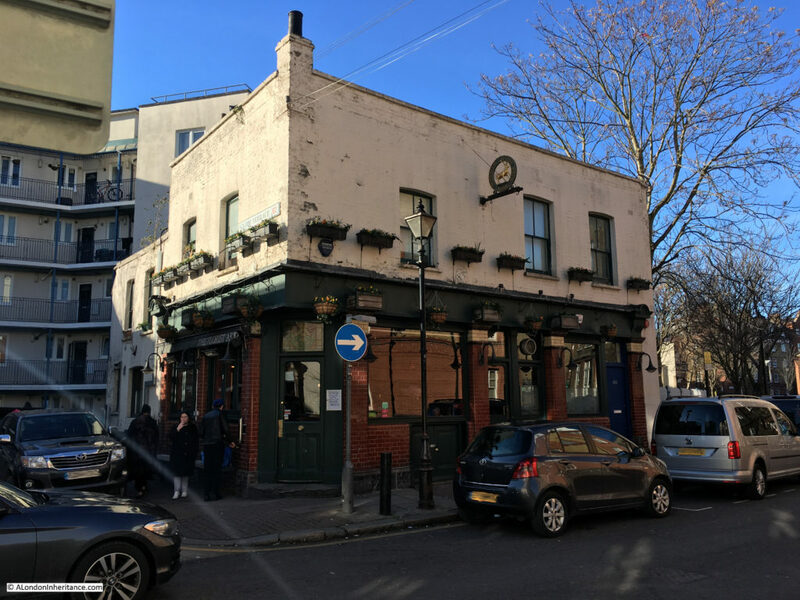 The name Globe Road is a reference to the pub, the Old Globe on the corner of Mile End Road and Globe Road. The street has been through several name changes, the northern end through which I am walking was originally named Back Lane. Globe Road is another long road that reaches down to Mile End Road, but for this post I only walked the length of the road to Roman Road (see the above map). 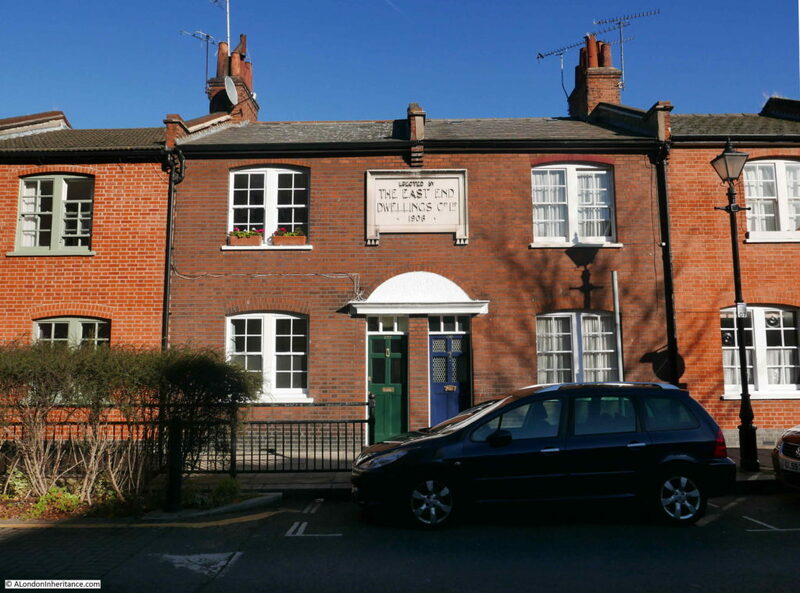 Most of the development of this stretch of Globe Road is down to the East End Dwellings Company who built large blocks of flats, as well as a rather nice terrace of houses. The following photo comprises Gretton Houses in the distance and Merceron Houses nearer the camera. The name Gretton is the same as the original name given to the short stretch of Old Ford Road roughly where number 33 now stands. I have not yet found the origin of this name. The East End Dwellings Company was formed in the early 1880s by the vicar of St. Jude’s, Whitechapel, the Reverend Samuel Augustus Barnett. 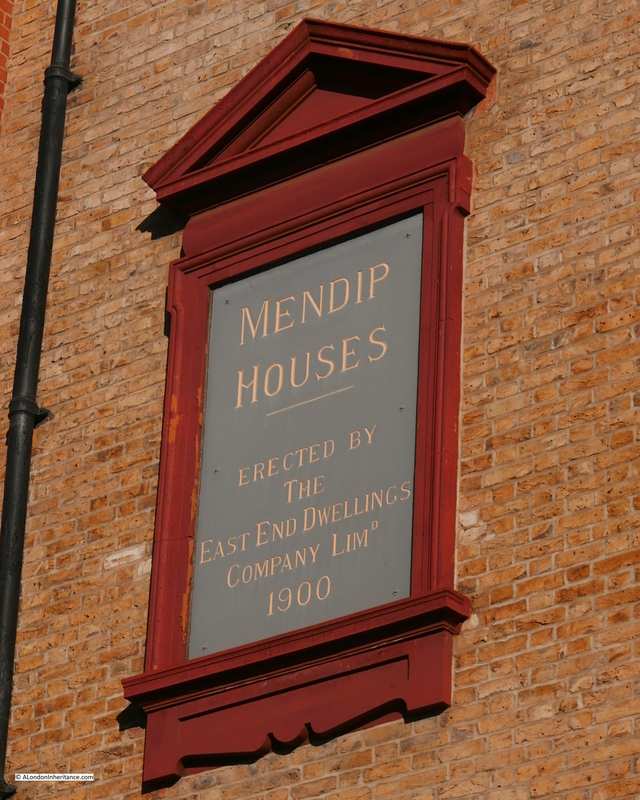 The intention of the Company was to provide housing for the poor, including those who other philanthropic housing companies often avoided, such as casual day labourers. 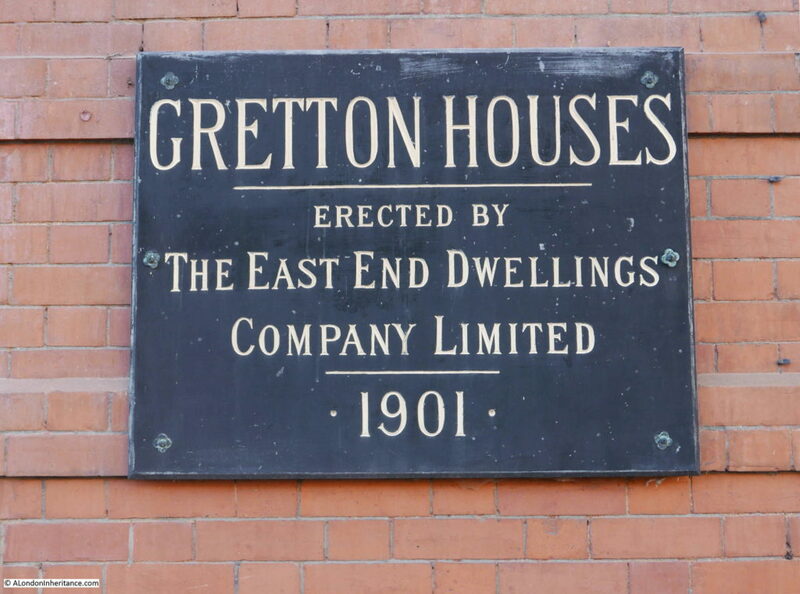 Gretton Houses were built in 1901 and designed by Ernest Emmanuel. Merceron Houses were built in the same year, also to a design by Ernest Emmanuel. 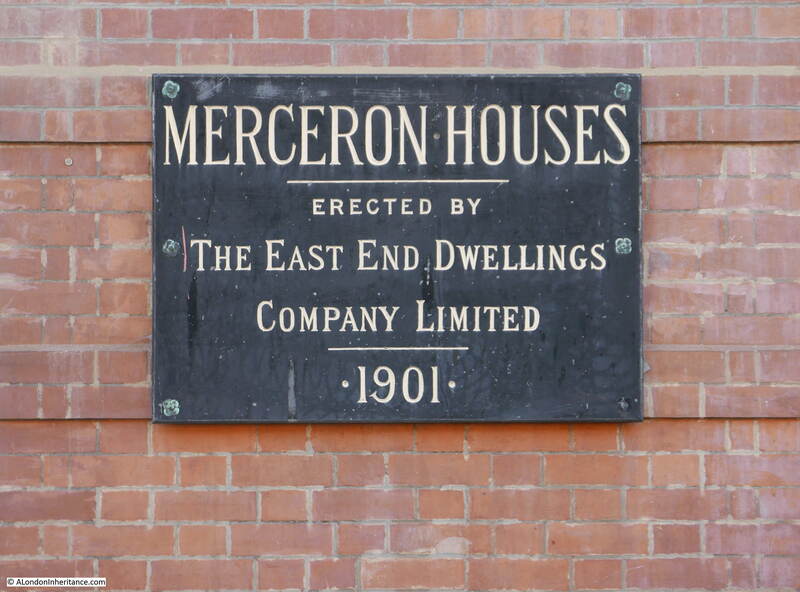 The name Merceron is from one of the east London families who had control over large parts of Bethnal Green. The excellent book The Boss of Bethnal Green by Julian Woodford details the story of the family and their impact on Bethnal Green. The buildings of Gretton and Merceron Houses that we see today are only part of the original construction as two blocks of these houses were demolished in 1982. Directly opposite Merceron Houses is a wonderful terrace of houses, also by the East End Dwellings Company. 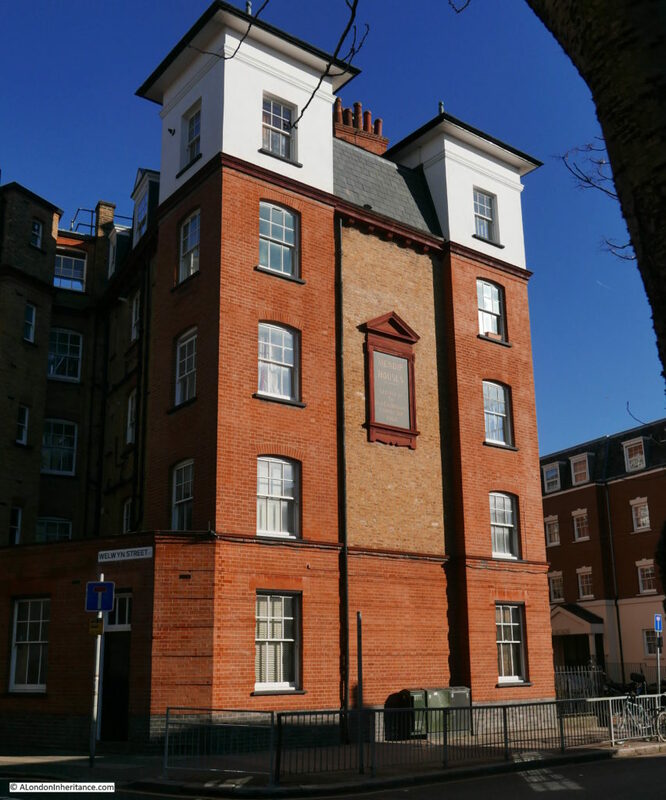 the central pair of houses has a plaque naming the company as the builders of the terrace and that they were constructed in 1906. 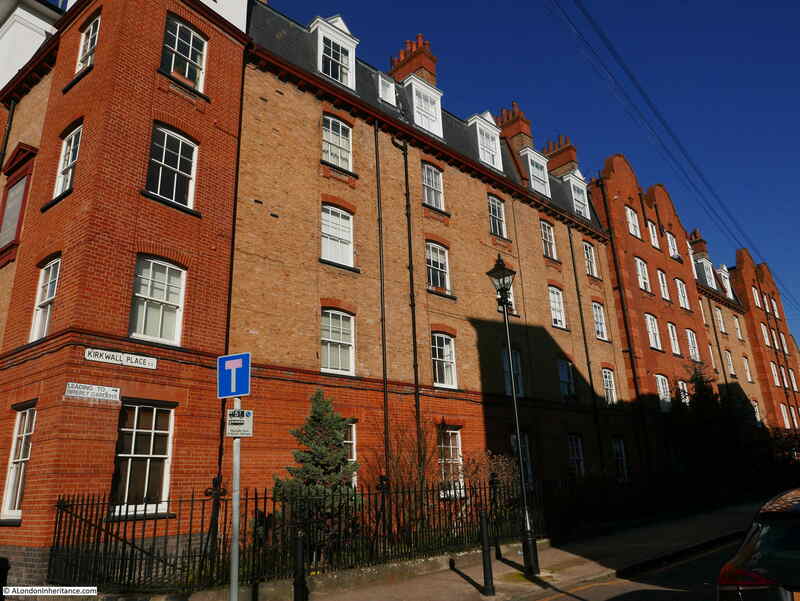 The terrace of houses were designed by Henry Davis and built on the site of a row of weavers cottages. 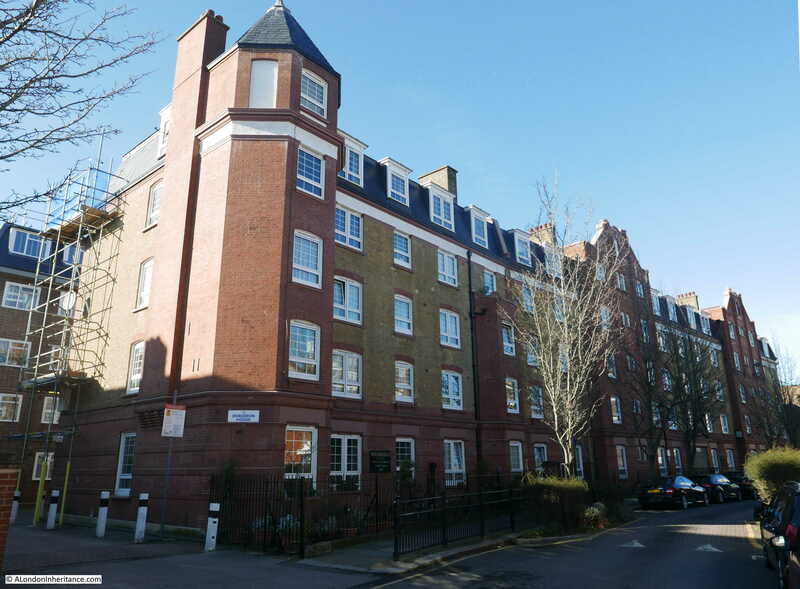 Further down Globe Road is another large block of flats by the East End Dwellings Company. 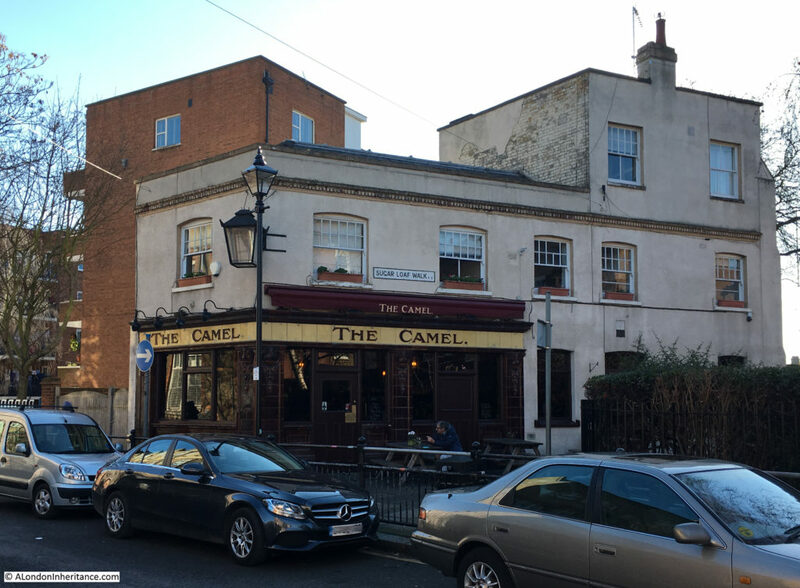 This short stretch of Globe Road is rather unusual for east London as two pubs remain open in the street. Both pubs have the same owners so hopefully an indication that their safety is assured for some time. This short stretch of Globe Road soon arrives at Roman Road. 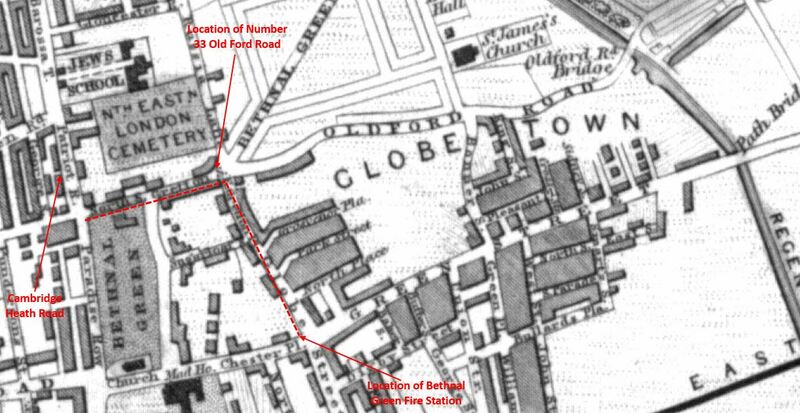 It continues across Roman Road and the next stretch of Globe Road is a story of lost railway stations and demolished pubs which I will save for another day, but on the corner of Globe Road and Roman Road is one of the magnificent, 19th century London fire stations. 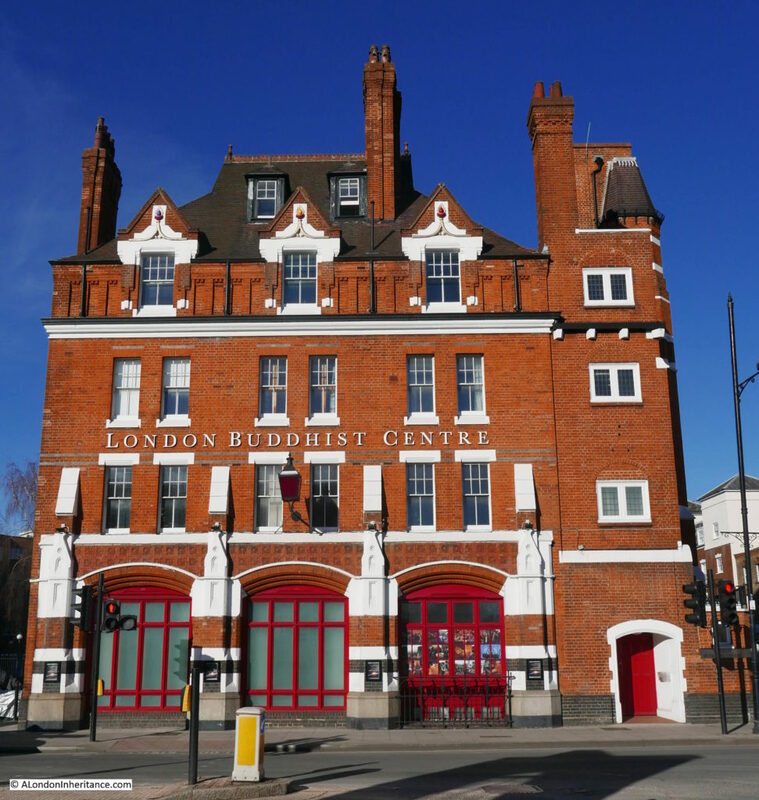 The building ceased operation as a fire station in 1968 and was empty for 10 years until it was taken over by the London Buddhist Centre who retain the building to this day. 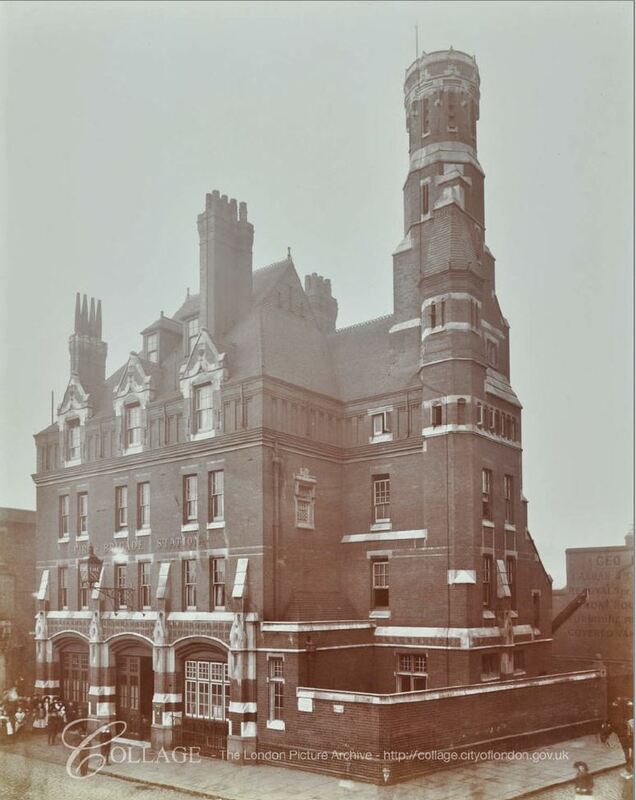 Although the building looks really good today, the brickwork glowing in the winter sunshine, it was even more impressive after it was first built in 1888. the following photo from 1906 shows a very impressive tower on the right side of the fire station. I assume this may have been for hanging and drying hoses. Unfortunately the tower was considerably truncated at some point. 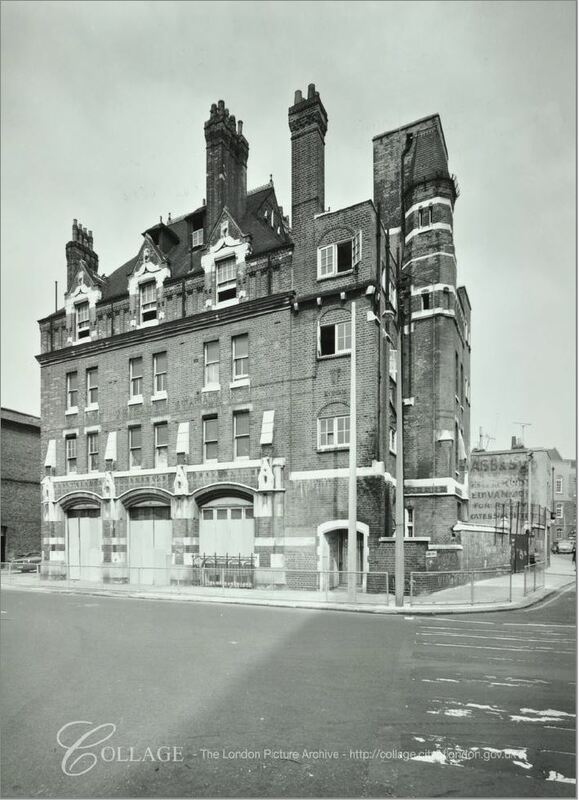 The following photo from 1973 shows the closed fire station with the main doors boarded up. Considering the length of time that the fire station was empty it is remarkable that it has survived. Grade II listing in 1973 must have helped save the building, 5 years after the London Fire Brigade stopped using the building and with still no use planned. I suspect the street sign dates from around 1986. Globe Town is a much older name, however after the GLC was abolished in 1986, responsibility for the area transferred to Tower Hamlets Council who created seven neighbourhoods, one of which was Globe Town. 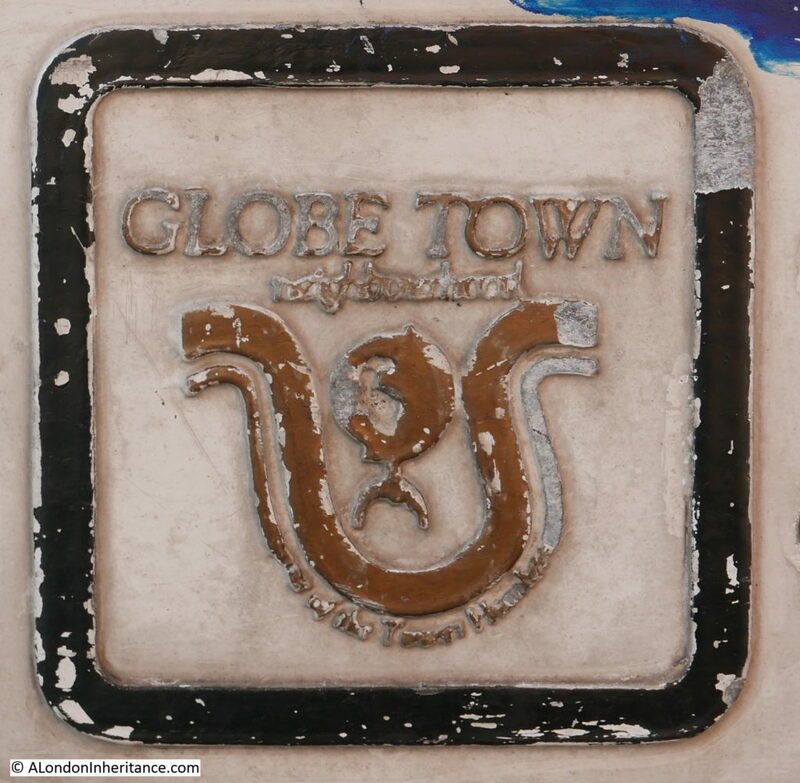 The name Globe Town can be traced back to the start of the 19th century. Estate building to the east of Bethnal Green started in the closing years of the 18th century and by the early 19th century, the name Globe Town was being used for this new area. The following map extract from 1844 shows the location of Globe Town. As there have been a number of changes since this map was created, I have marked the key locations from today’s post. The red dotted line indicates the route I have walked – a very short distance. I wonder how long the remains of the shop at 33 Old Ford Road will be there? With the speed of redevelopment across London I am really surprised that if indeed it has been closed since at least 2008, it has not already been converted into flats. 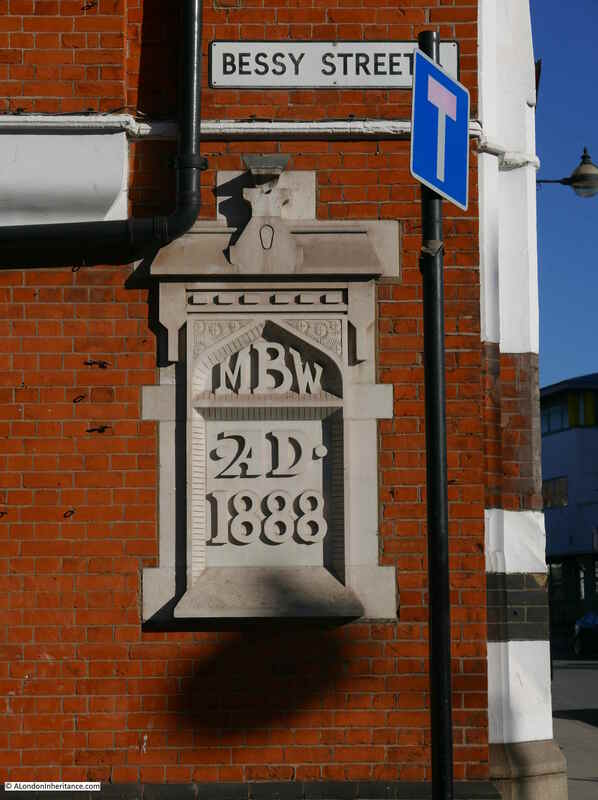 After finding the East End Dwellings Company buildings in Globe Road, I am also a good way through a side project to track down all their remaining buildings across London. Finding one location also always identifies new areas to walk, so the rest of Old Ford Road, Globe Road and indeed Globe Town have been added to an ever increasing list. Returning will enable me to keep track of the old shop at 33 Old Ford Road. 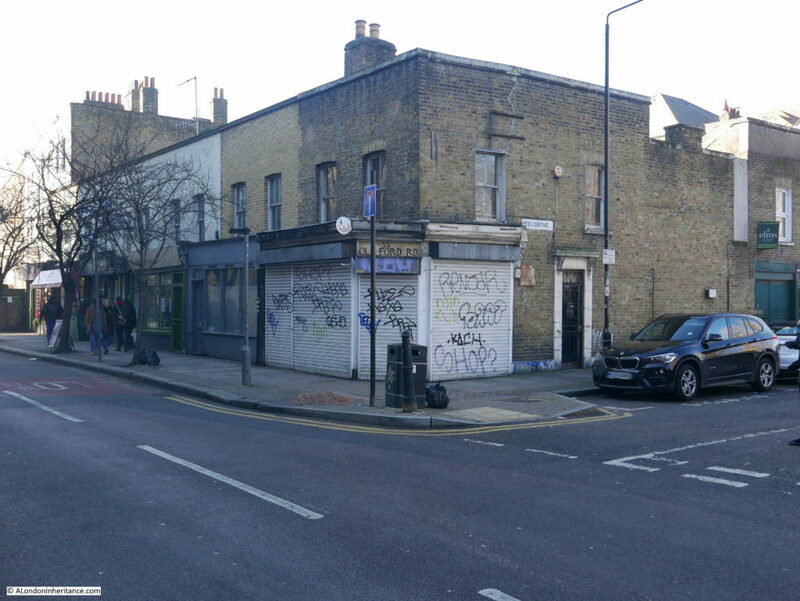 This entry was posted in London Streets and tagged Bethnal Green, Globe Road, Globe Town, Old Ford Road on February 10, 2019 by admin.